Low muscle tone is a common characteristic for babies born with Down Syndrome, therefore it’s important to work on developing their core strength as early as possible. We’ve had Noah in private therapy (physical, occupational, and speech) since he was three weeks old, and have seen tremendous improvements in all areas. We visit the physical therapist weekly on Tuesday and Wednesday. Their goal is to help Noah develop gross motor skills; crawling, walking, jumping, running, etc. When we began Noah’s therapy there was a lot of overlap between occupational and physical therapy, therefore we only saw the occupational therapist. However, now that he can (sort of) sit up that gap is widening and we see both the physical and occupational therapist. Our appointments are approximately thirty minutes long, and consist of what looks like at first glance a lot of playing. However, all of the “playing” is actually very strategic, and designed to work on specific areas of Noah’s development. Since Noah’s back muscles are much stronger then his stomach ones, (his core) the focus for the time being is strengthening his core muscles. This is accomplished by various activities such as: getting him to sit up, having him reach across his chest to grab objects, and having him lie on his back while we touch his knees to his elbows. It’s been fun watching him grow from a weak, shaky, little three week old, to a strong, (semi) stable, six month old! Today was the first day his physical therapist used the long, round, soft, “pillow” you see in the video during our time together. As you can see it, Noah sat up behind the pillow, and sort of rolled it back and forth with the help of his physical therapist. He did a great job, and didn’t tire out at all! This little guy really enjoys going to all of this therapy visits. He works hard while he’s there, and thinks it’s a weekly play date! 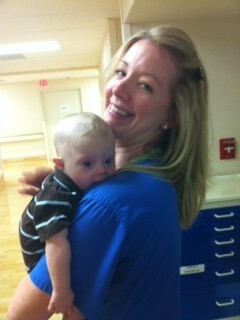 As an added surprise, we ran into Noah’s labor and delivery nurse while we were out! She was very supportive and loving towards us when Noah was born, we like her – a lot! Tomorrow is Noah’s six month check up, please be praying with us that everything goes well, especially the CBC test we are waiting to hear back on! have to say that blue tube is a very walmarty blue, but what a cool excercise tool. i love that it looks like he’s having fun and gets such great socialization and varied activities to stimulate his body and mind. Our little lad (11 months) has regular sessions but our physio was puzzled by what exercises such a little one could do on a gym ball. Can you elaborate as to what type of things you do? 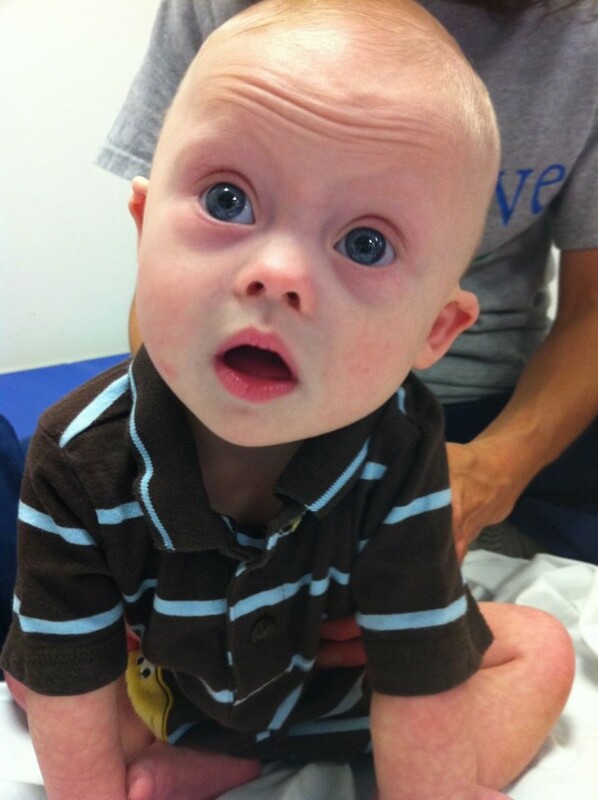 Hi I have little baby Daniel one year and two month old with down syndrome. He can sit himself and little bit starting to crawl. I am really new mother with down syndrome baby and having hard time to grow him up. I am learning from your website a lot. According to doc. I have done almost all the test. We did blood transfusion because he has very low blood ( haemoglobin), doc thought he needs to do bone marrow we have done to but result was diluted and doc was telling we need to do it again. But I refused. I felt like he got a lot of pain when they took bone marrow…. He has congenital heart disease too. Doc suggested that they will wait until he become 4 years old to do the surgery. I am having hard time to feed him. He just eat so little. Is there anything you could help me to feed him properly?